Although Maryland’s retail gas prices were lower than the national average in 2011, consumers are still getting hit at the pump — for paying with plastic rather than cash. A growing practice is to offer cash and credit card prices to combat increasing numbers of credit card users, rising gas prices and high “swipe fees,” transaction fees set by credit card networks for banks. Although credit card prices may differ as much as 5 cents from cash prices, gas merchants are “within the law,” said Joe Shapiro, a spokesman with the comptroller’s office, which regulates gas stations. “The legal requirement is to advertise the lowest price for regular gas,” Shapiro said. He said the comptroller’s office has not received many complaints about the practice. Some consumers, however, say they feel deceived. Gas retailers, though, say that they’re put in a tough situation. “In our business I think the unfortunate thing is that you have to put the price out for everybody in the world to see on the street, all your competitors see it, all the consumers see it. 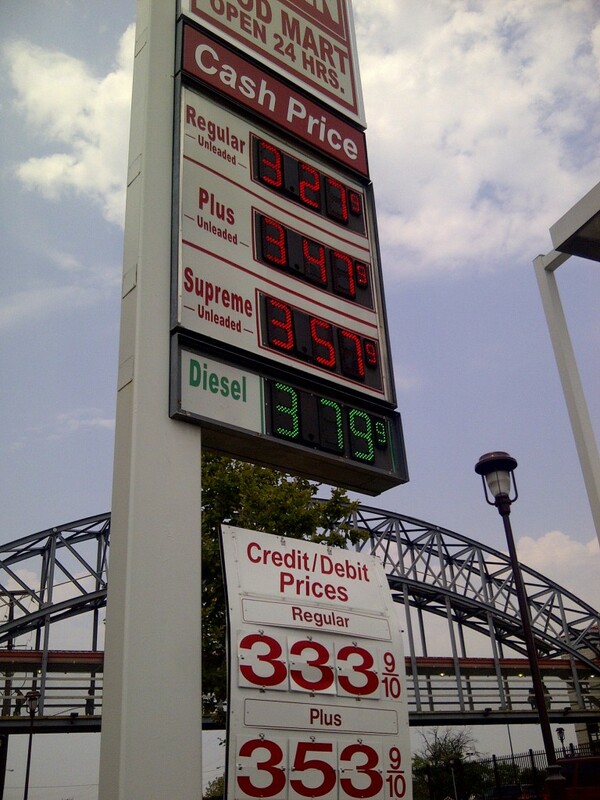 So when they see a lower price, their first reaction is I want that price,” said Peter Horrigan, president of the Mid-Atlantic Petroleum Distributors’ Association, which represents about three-quarters of the state’s 2,000 independent gas marketers. All those transactions add up. Two cents on every dollar per gallon pumped at even $3 per gallon is 6 cents the retailer is paying in swipe fees, up to half of a station owner’s profit per gallon in a “very good” market, Horrigan said. In some cases, swipe fees are as high as 3 cents a gallon. According to an April report by the National Association of Convenience Stores, convenience stores sell over 80% of U.S. motor fuels amounting to $486 billion in fuel sales in 2011. The industry paid $11 billion in debit and credit card swipe fees, up 23% from 2010. “Card fees exceeded industry profits for the sixth straight year and were 87% higher than store profits,” the report said. While global crude oil prices accounted for about 68% of motor fuel price per gallon in 2011, 9% was distribution, marketing costs and profits, including swipe fees, said the U.S. Energy Information Administration. Swipe fees, nevertheless, are the second-highest operating expense for convenience stores, only topped by the costs of labor. Banks argue that the swipe fees are a cost of doing business that provides a convenience to the retailers.